Some nice examples that are built and just need to be imported, all are 25 years old or older. These are all out of my price range but I'm heading to Germany in August and will see whats available at that time in the $70k or less range. I'd just be afraid to import anything MAN. Getting parts in NA would be a huge hassle to ship from Europe for everything. Our 24 year old OKA was built in Australia. Simple mild steel rigid ladder frame chassis, superb bush performance from very long leaf springs. All glass is flat all body panels easily remade. Any part you can't buy you can make. The Perkins was from the UK, but is often replaced with a Cummins 6BT and 5 speed Allison. 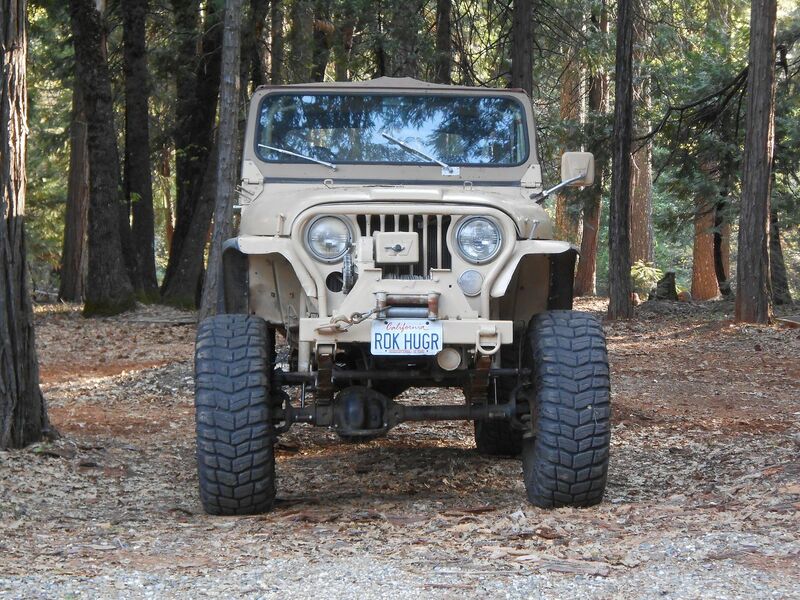 The diffs are Dana 60 front and 70 rear, sometimes replaced with 80s. Can be maintained forever. 1.9m overall width (our body is 2.16m x 6m overall including spare wheels). Small enough to go anywhere, big enough to provide some comfort and carry some fuel and water. Would seem to be ideal for you guys in the States where these parts are cheap and still being made new. That does look like a good chassis for an expedition truck, simple with standard parts so relatively easy to maintain over a long life. In the US you see older motor homes from Bluebird that live on forever for the same reason. I like the idea of that yellow rig above with the mounting channel along the length of the box that the marsden mats are secured to. I can think of a lot of things you could use those mounting strips with - such as securing a table, or a temp shower curtain for outside showers, or a fish/game cleaning station. Very interesting. Looks like they have more airline track on the rear and the other side too for additional mounting points. I added track to the interior walls of the rear garage storage area to allow hanging stuff from the sides. I put together a clothes/towel drying rack that attaches to the side of the truck with suction cups but you could do the same using the track for mounting it. I've always thought the Oka is a great concept as a vehicle with worldwide available mechanical components and even some body parts. I can see that stuff being very handy. I'm looking for a self sustaining rig to explore North America. Fitting in shipping containers isn't a concern for me, but I'd like to keep the vehicle 25 feet or less in length. The budget would be $250,000. I am not at all opposed to a good quality used unit. 1. Really good off-road 4x4, rear and front locking differentials, winch, decent approach/departure/breakover angles, 3 point camper mount etc. 2. Have or be able to be modded for large solar+lithium battery bank. Electricity the main power source. 3. Bellow/portal access from cab to camper. 4. Large freshwater/grey tanks, cassette or composting toilet, large diesel fuel tank(s). 5. Must be 0F to 110F capable. Double pane windows, interior or heated tanks and lines. Air conditioning and heater systems that are commensurate with these temps. 6. Parts have to still be available. 7. A vehicle cab that you don't have to put ear plugs in at 65 MPH and doesn't beat you to death. 8. If foreign, must be left hand drive and registerable in the US. I've been checking Unicat and Expedition truck brokers but haven't found anything that meets my needs yet. What route would you take for $250K? I think it is 185k, not sure if euros or dollars. The vehicle suggested above is the antithesis of a 3 pt mount. Parts for the Steyr are available but not in every N America town... but no electronics, ULSD not required. I’ve owned a similar vehicle for 11 years and still like it. Charlie brings up some interesting points. I don't think it would be considered thread drift to discuss the merits/drawbacks of 3pt mounts in the context of Expedition vehicles. Is there any consensus around when a 3pt is needed/desired vs virtually necessary? Meaning, is there a weight limit ,length limit and or height/frame style that would dictate a mounting method? Or maybe it all comes back to the old adage "It depends on what you want to use it for...."
I saw a thread that sort-of attacked this topic on the Fuso forum but it might at least stimulate some discussion in the context of "Exped Vehicle Selection Thoughts"
There is a simple answer: Every truck chassis needs to be approached differently with the subframe design. The fuso for example needs a spring mounted frame as a three point mount would create a point load and cause a frame failure. The MB Sprinters and Transits on the otherhand have a very stiff frame and only require some rubber bushings. In the last couple years I have found and read many posts from people that "claim" to know and teach others about subframe designs.... To be honest with you, I would only commission someone to design and built me one if they have a proofen track record. Even the big names in this industry had and still have failures! In other words, It's not easy or straight forward to design and built one. To my knowledge there are only a couple of companies that have a solid design on hand. Send me a PM if you need to contact them. Apologies, I've already made my choice. I simply thought the discussion had merit in the context of people (like the OP) who are weighing their options across the broad spectrum of choices. EDIT: Speaking of which, is there a specific way you addressed the frame flex on your sprinter with the windbreak connection to the cab? Our wind deflector/ storage compartment is glued to the Sprinter cab and camper body. We had zero frame flex. 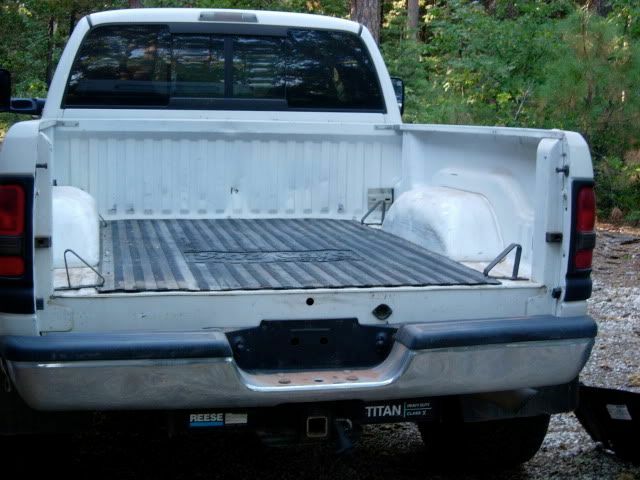 I'd 3 point a pickups flatbed. The I could bolt the box down any which way. Some further musings on frame flex. 17 years ago I bought a new Dodge extra cab short bed (139 inch wheelbase, 6-1/2 foot bed) 2500 4WD Cummins H.O. 6 speed manual because it checked all my engine and drivetrain boxes and would fit down the descending corkscrew driveway to the subterranean parking structure of the Music Center in LA where I played bass trombone with the LA Phil. The other enticement was a feeling that this truck had a good chance to outlive me. So far, so good. Initially, I bought the truck to flat tow my rock crawler to the trailhead with no desire to have anything but a tow vehicle. 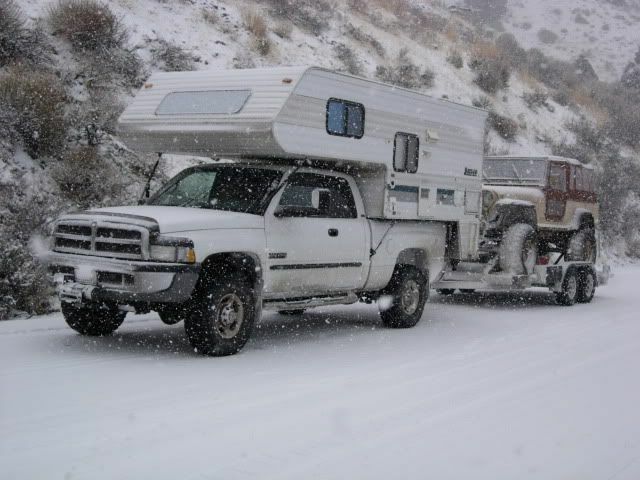 Without towing brakes it was not very successful (my up armoured, 37 inch tired, CJ-8 weighed 4400 pounds) but got a lot more stable when I picked up the L.A. Recycler one day and bought a 3-year old Lance Lite 165-S, short bed, xcab camper (1842 pounds, wet) that same afternoon. As I grow older, the camper makes a lot more sense than laying on the ground and letting the bugs crawl on me at the trailhead. The next buy was a car trailer which solved the brake problem. But, as time passed I sold the rock crawler and decided to build up the truck enough to work in most off road environments. 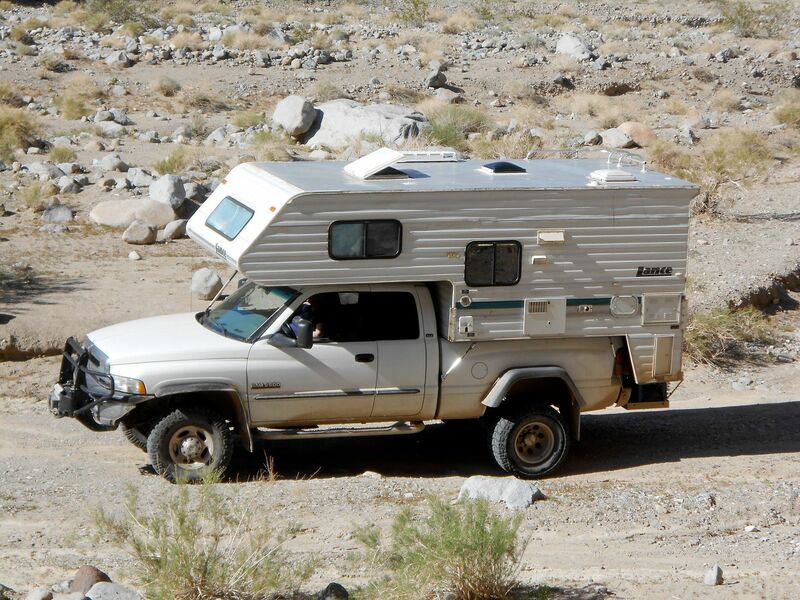 Jack, on this site (locrawln) has a short bed GM 2500 pickup to which he has had several campers of differing weights attached and reports minimal frame flex. This is also my observation. So what are we to learn here? Why do some have a lot of frame flex and others don't? And why do some Expedition camper manufacturers use a 3-point or diamond shaped 4-point suspension on some products and not others? 0. As noted above keep it as simple as you can with parts that can be replaced where you sojourn and under the conditions of your travel style. 1. The shorter the wheelbase of your truck the less flex or twist you will get out of the frame. 2. The lighter your camper the less twisting stress you will put on your truck's frame. This also has to do with the tuning of your suspension. A soft suspension will have you leaning all over the place but wheels always on the ground and transmit less flex to the truck frame; but too stiff will give you the herky jerkys, lift an occasional wheel off terra firma and transmit a lot of flex to the truck frame. It's taken me years of trial and error to dial in my suspension. On the Mojave Road with the chase truck and chow wagon for a herd of mountain bikers. 3. 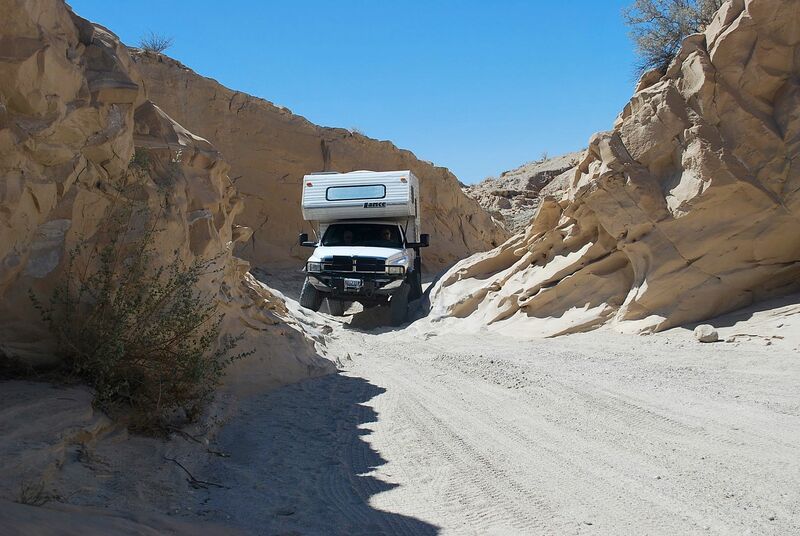 For a drop in camper, it is advantageous to have camper Guides. I used Lance's design. They keep the bottom of the camper box from shifting from side to side preventing movement and uneven stress on the tie downs. A thin, sticky rubber bed mat is prefered to a thick one to reduce the side to side rocking unless you need cab clearance then a harder subframe of some sort is required. 4. Keep all heavy stuff down as low as possible in the rig. It may look cool to have a couple spare tires, a canoe, and and big air conditioner on the roof but that's a disaster ready to happen on a 20 degree sidehill. I've tried to keep anything from living on the roof but relented when I saw the value of solar panels for boondock travel. 5. One more thing. Lowering the tire pressure when off road helps reduce frame flex. I don't mean dropping a few pounds but experimenting with pressure to help even out the terrain. I drop mine from 80 or 110 pounds down to 32 pounds for dirt roads of any consequence. For blow sand and shooting the dunes I'll drop down to 18-20 pounds tire pressure on my super single wheels. This varies widely from rig to rig. The CJ-8 above was @ 3 pounds of air in those 37's for shooting the dunes. 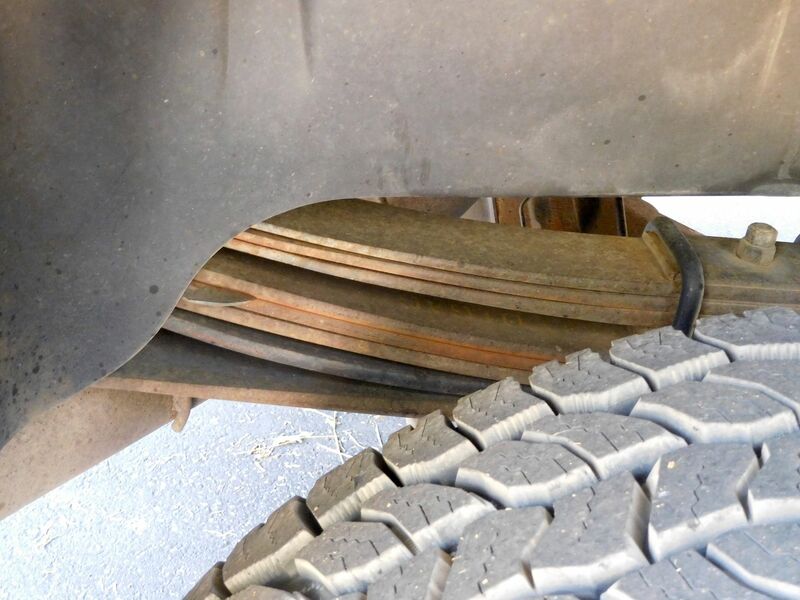 Lowering the tire pressure become part of your suspension, off road. Your job is to find the sweet spot for your rig. 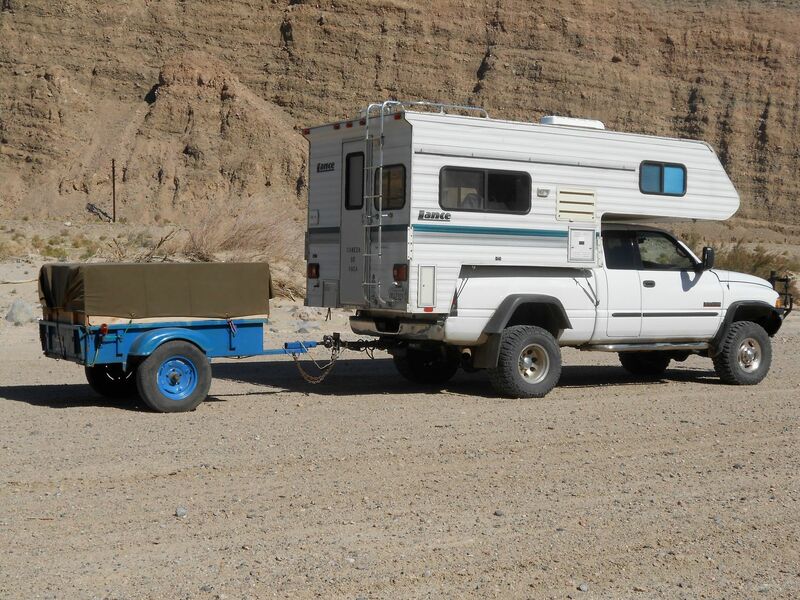 So, if you have a long wheelbase, flexy framed rig and need a 3-point camper attachment then by all means go for it. 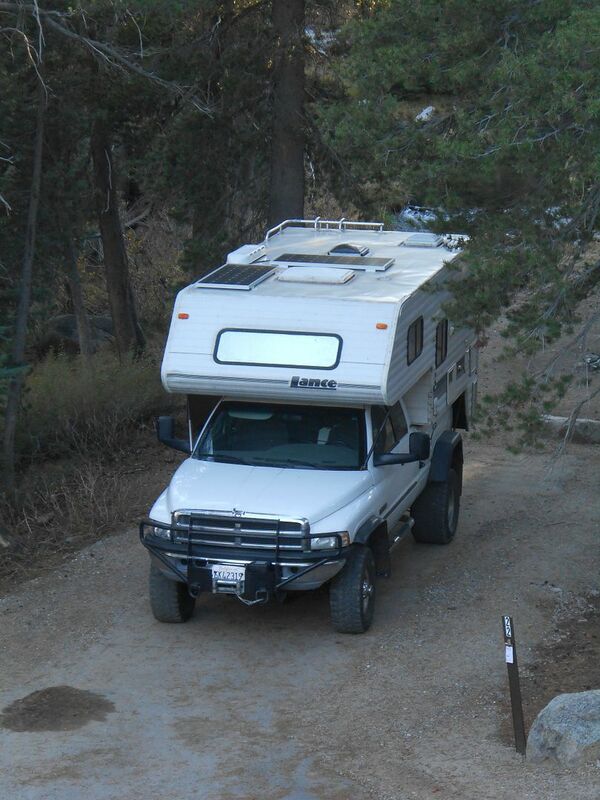 But a short, lightweight truck and camper does not need as much frame flexing special attention.